IRB is the acronym for Institutional Review Board for Human Participants. It is also called ERC (Ethical Review Committee) at other institutions. 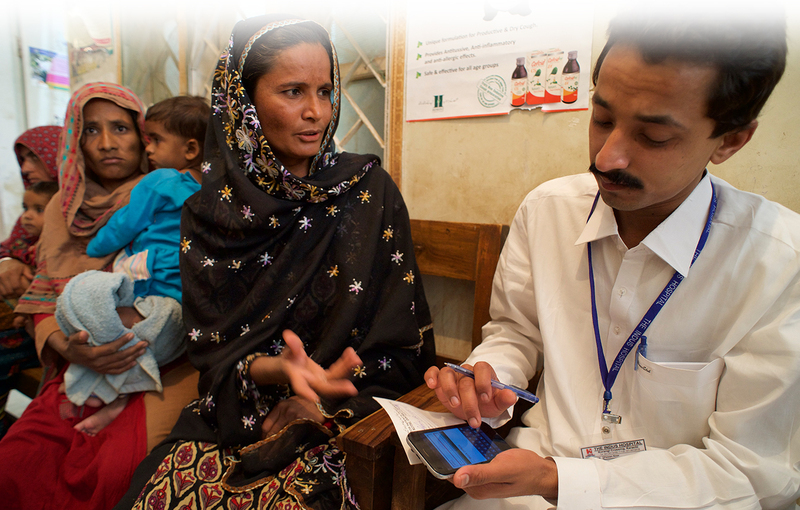 The purpose of an IRB is to review all research that directly or indirectly involves human participants, and to ensure the protection of human participants as subjects at IRD and The Indus Hospital, Karachi. 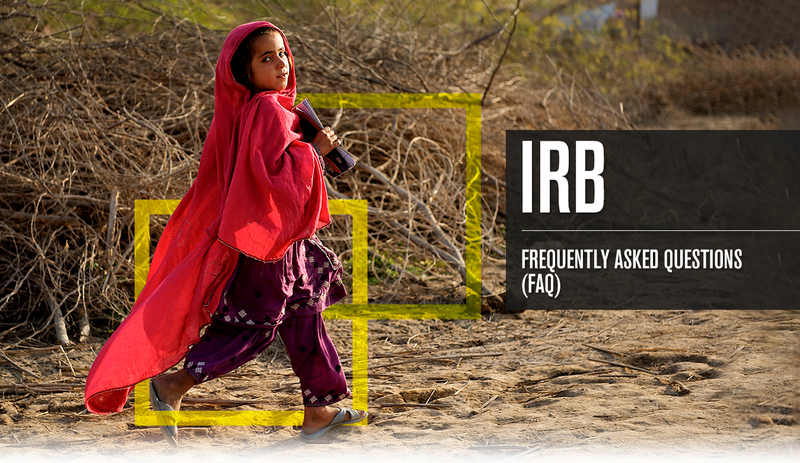 IRD-IRB operates under a charge. ⚬	information which has been provided for specific purposes by an individual and which the individual can reasonably expect will not be made public (for example, a medical record). In order for your project to be considered human participant research covered by IRD’s Human Research Protection Program, the criteria for both definitions must be met. When am I required to submit a proposal involving research with human participants to the IRB? Yes, if the study meets the definition for research with human participants, as explained above. Written approval from the IRB must be in place before any interventions or interactions with human participants (e.g., recruitment) actually begin. It is now common practice by journals to check if IRB approval was given prior to conducting research. Yes, if your research project involves active data collection. However, if your research project involves use of existing information collected from human participants (e.g., publically available secondary datasets, existing biological samples), but there are no identifiers linking individuals to the data/samples, then the activity may not require IRB review. It is best to check with the IRB for further guidance. What is a pilot study and do I need IRB approval for a pilot study? A pilot study is a preliminary investigation of the feasibility of a study, usually done on a small scale (approximately 30 or fewer subjects) and exploratory in nature. It is designed to help the investigator refine data collection procedures and instruments or prepare a better, more precise research design. Such a pilot would not contribute to generalizable knowledge and therefore is not considered research and does not require IRB review. Data collected from a pilot study cannot be used as research data. However, medical interventions or interactions for research purposes, especially those involving invasive procedures, do require IRB review regardless of the size of the study. No. It is not a good idea to self-exempt your human participant research projects. Instead, determining if a project is exempt from IRB review is an administrative review process handled by the IRB staff. If you think your research may be exempt from IRB review, you may submit an exemption determination form. The IRB staff will review the information submitted and make a determination as to whether the exemption can be granted. I will be collaborating with another institution. Do I need to submit to IRD’s IRB and the other institution? If you work for IRD, or the Indus Hospital, and you are the person responsible for the conduct of the study (PI), you must get IRD-IRB approval to conduct your research regardless of where the research takes place. Please note that the Indus Hospital does not defer to another institute's IRB approval. That depends on the nature of your study and the characteristics of the people you intend to recruit. Research projects that involve only minimal risks are eligible for expedited review, for which you should allow at least 3 working weeks for IRB review. Research projects that involve greater than minimal risk to participants will need to go to the full board for review. For applications requiring full board review, you should allow at least 4-6 working weeks for review and approval of your study. No. There is no provision that allow for IRB approval of research that has already been conducted. If data was collected for purposes that the IRB determines to be non-research (e.g., program evaluations not initially intended to be used for research), IRB approval can be sought for the data analysis going forward. What is an honest broker system? Under an honest broker system, patient data or biological specimens are stripped of any identifiers, and provided as de-identified data. At our institution, this happens to facilitate the researcher meeting one of the exempt review criteria. The person who de-identifies the dataset is called the honest broker. I don’t know where to start with IRB submission. What needs to be included? What does the IRB look for in an application? Are there standard criteria for evaluation? The IRB evaluates every research protocol according to the ethical principles described in the Belmont Report (http://ohsr.od.nih.gov/guidelines/belmont.html). Basically, this means the IRB considers whether the risks and benefits of a study are acceptable and managed appropriately, and whether individuals being asked to participate are adequately informed about the research and its possible risks. Considered another way, investigators could look at their plans from the point of view of a subject, or an observer concerned about responsible research. Who are the subjects and how are they recruited? Could they be lured or coerced to participate? Is it through an institution that may have responsibilities toward them (e.g., a school or hospital) and should be consulted? Do they understand, in advance, what they are agreeing to participate in and give their consent willingly? What will they actually do, and what is done to them, during the study? Is it possible that the experience might be injurious, painful, uncomfortable, needlessly boring, embarrassing, offensive, or otherwise stressful? Might there be long-term consequences? Could the subject be endangered, compromised or embarrassed if information collected leaked out? There are many possible considerations, but they should not be difficult to understand if one assumes the subject's perspective. The IRB’s role is to look at the study from this perspective and to ensure that proper precautions are taken to protect individuals when they agree to participate in research. What does "informed consent" mean? What are its essential components? Fully informing participants of the risks, benefits, and procedures involved in a study is a standard requirement in research with human participants. Ethically and legally, consent is not considered to be "informed" unless the investigator discloses all the facts, risks, and discomforts that might be expected to influence an individual's decision to willingly participate in a research protocol. This applies to ALL types of research including surveys, interviews, and observations in which participants are identified, and other experiments, such as diet, drug and exercise studies. For a complete list of the components of informed consent that are considered essential by the IRD IRB, please refer to consent adequacy checklist. Are there different types of informed consent? What are they? • Signed informed consent is the standard expectation in research. This is in the form of a document with the elements of informed consent, signed and dated by the participant and kept as a record by the researcher. • In research with children (individuals under 18 years old), assent of the child and parental permission are standard requirements. • Verbal informed consent in which signatures are not taken of the study participant. An information sheet or contact numbers are given instead. The form are signed by the person taking consent. I am not collecting any identifying information. Do I still need an informed consent form? Yes. If the proposed study is truly "anonymous" - no coding for identifiers (e.g., names, NIC, drivers license numbers, etc. ), a modified informed consent form (often called an information sheet) may be used. 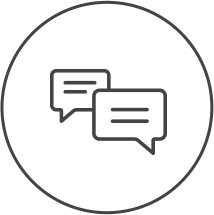 That is, all of the elements of consent must be documented for the participant, but the signature line is replaced with a statement informing the participant that completion and return of the survey is considered implied consent. If, however, the procedures involve risk or biological sample collections, written consent may be required. Are there any sample consent forms or consent form templates available for review? Click for a sample informed consent form on the IRB website. What are the IRB requirements for training? Completion of CITI human subject research training by all persons working on a research project (all investigators and other key study personnel, including all persons who are responsible for the design, conduct, data analysis or reporting) is one of the requirements for protocol approval by the IRB. How can I take the required training? IRD provides access to the required training through the interactive online Collaborative IRB Training Initiative (CITI) Course. When should a modification (amendment) to an approved research study be submitted? Any and all changes to an approved research study must be submitted for review and approval prior to implementing the change(s) into the research study. Does approval of an amendment to an approved research study extend the original approval date? No. The expiration date of the original approval is not changed by the review and approval of an amendment. If IRB approval of the human research expires, all study procedures related to the protocol under review must cease, including recruitment, advertisement, screening, enrollment, consent, interventions, interactions, and collection of private identifiable information. You need to receive continued approval from the IRB in order to continue research. It is the responsibility of the principal investigator (PI) to ensure continued approval of his or her human participant research study. As a courtesy, approximately 60 days prior to the approval expiration date, the IRB office will send an email to the principal investigator and the faculty advisor (if the PI is a student), alerting them to the impending approval expiration. If no response is received to the reminders, a notice indicating the approval for the study expired may be sent after the approval expiration date. If approval is allowed to expire, all research on the study must cease until renewed approval is granted. Progress of approved research must be reported, in the manner prescribed by the IRB, on the basis of risks to participants, no less than once a year. For all renewal forms and more information visit our forms website. In the case of a potential unanticipated problem involving risks to participants or others, when is the principal investigator expected to report this occurrence to the IRB? Serious adverse events must be reported to the IRB immediately, with a written report by the PI following within 3 days of the PI’s becoming aware of the event. Serious adverse events are (1) death of a research participant; or (2) serious injury to a research participant. All other non-serious unanticipated problems should be reported to the IRB within 15 days of the first awareness of the problem by the Protocol PI or another researcher, IRD-IRB Admin, or a member of the IRB. Prompt reporting is important, as unanticipated problems often require some modification of study procedures, protocols, and/or informed consent processes. Such modifications require the review and approval of the IRB. Can the IRB temporarily or permanently discontinue a research project as result of an unanticipated problem involving risks to participants or others? Yes. If an unanticipated problem poses a risk(s) to the participants or others, the IRB may temporarily discontinue a research project until a thorough investigation has been conducted. Dependent on the investigation, the IRB may request changes to a research study or permanently discontinue the research study. Yes. As a result of the IRB's investigation of the unanticipated problem, revisions to the approved research study and the informed consent form may be requested.